Arjun Rath, 11, armored up and ready to bat. Vihan Gupta at a recent practice in Lexington, Mass. His dad, Vivek, started the league because he wanted to share his love of the game. Coach Shaheer Mohammed encourages his team from Lexington, Mass. after a difficult loss. It was an all-American scene to be sure, but not your typical 4th weekend of July family sporting event. 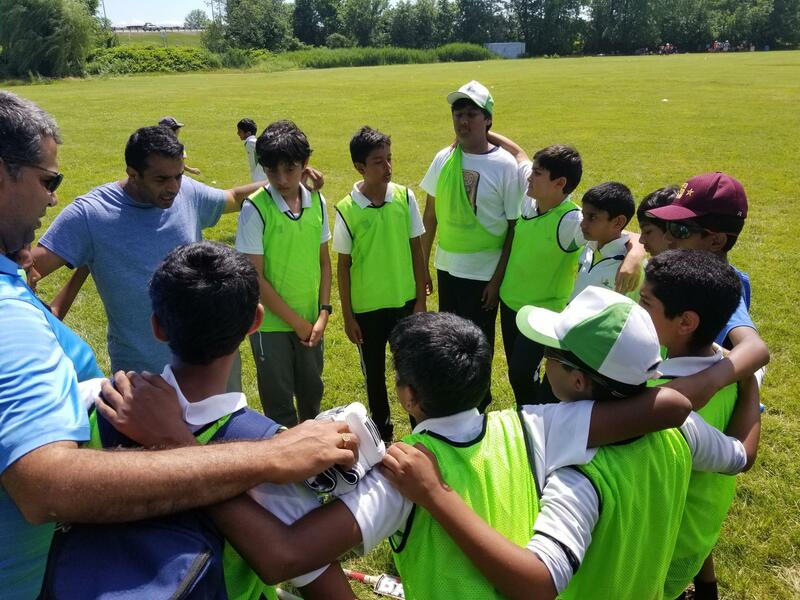 Between the catered boxes of chicken curry and the booming Punjabi music, the recent weekend tournament in West Haven, Connecticut had the feeling of a big Indian family reunion. The sport was cricket — and the vast majority of the families, easily 95 percent, were South Asian. To explain a little — and generalize a lot — Indians LOVE cricket. The game is "part and parcel of what India is all about," according to Dr. Prasad Srinivasan, an allergist and Connecticut State Representative who spoke at the opening of the tournament. 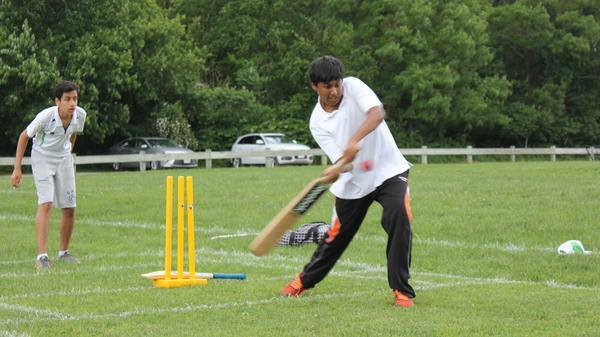 Southern Connecticut is home to a sizable South Asian community, and it's cricket-loving region — the Cricket Hall of Fame is in Hartford. "Cricket is taking such a firm foundation in our nation," Dr. Srinivasan told the crowd, "and I'm very thankful to all of you, I'm so glad cricket has found its home in the United States." I was here along with my 11-year-old son Arjun, representing the Lexington Cricket League from Massachusetts. And we were feeling a little intimidated. This was LCL's first tournament which meant using a traditional, hard, leather ball. Our kids had been playing with the softer youth ball, which resembles a heavy tennis ball. They'd had less than two weeks to practice batting and bowling (the cricket equivalent to pitching) with the hard ball. Outfielders in cricket have to catch it bare handed. "It hurts," said Nu Shaheer, correcting himself that "it doesn't hurt that much, but it hurts when you're scared"— a tough paradox for a kid, that you have to relax to avoid pain. Vivek Gupta started the Lexington Cricket League a few years ago. Like a lot of the dads I've met through youth cricket, he came to this country with a passion for the game, and wanted to share that with his son, Vihan. A few years ago Vivek took him and a few friends to a local park to teach them the game. "Vihan got four, five of his friends, we were playing and suddenly we start seeing some kids walking in, trickling in and we're looking at where did [they] come from?" He laughs, "some Indian parents just dropped their kids and went away. So, okay, since you're here let's start playing! And that started growing, more started coming." With enough kids, Gupta got organized. A few years after that pickup game started the Lexington Cricket League, our team was organized — but terribly overmatched. The rest of the teams playing at the tournament in Connecticut had a lot of experience playing hard ball, and we were facing national champions. "It felt kind of nerve wracking like when I was batting," said Sohum Atnoor. When you're batting in cricket, you're not just trying to hit the ball, but keep it from knocking down a set of wooden stumps behind you. It took a lot of concentration. "It was just—" deep breath—"Ok, hit the ball and don't let it hit your wickets." But for the first time, our kids were batting against bowlers who knew how to spin that ball, so it could bounce around the batter and knock down those stumps. That's exactly what happened to my son on his first pitch—he was out before he knew what happened. The rest of our batsmen went down in similar fashion. It was brutal. Dads were drying tears on the sidelines. But after that first game, things turned around for the kids. Not in terms of winning — we lost every game we played in the tournament. But they did improve a lot, and understanding they were playing the best seemed to give them permission to have a good time with each other while losing. "I feel like we were having fun," said Atnoor. "It didn't really matter what happened. This is our first tournament. It's supposed to be like a team bonding thing. And I get to make some good friends with the people I was around." The same was true for the parents. It's not just the love of cricket that's brought us together. I didn't really have a love for the game myself—I played it a few times as a kid, and it was pretty absent from my life in America. But there's a deep draw to connecting with other people of South Asian descent, desis we call ourselves. "We feel good when we connect with other people of our community," says Gupta. "So that's this one avenue for a whole bunch of families to come together." But as good as it feels for us desis, Gupta and other organizers aren't happy with the idea of cricket in the U.S. just being a Desi thing. For one thing, what about the immigrants from all those other cricket-loving countries? "We've not been able to do a good job of sort of communicating to them that yes, we are [organizing this] sport for the children." Gupta wants to do a better job to reaching out to immigrants from countries like Britain and New Zealand, as well as African and Caribbean Countries. But even that won't be enough. The ultimate goal is to get all kids as excited about the game as this group, and establish cricket as a mainstream, all-American sport. When a kid really gets into a sport, parents often come along for the ride. They become driver, cheerleader, fundraiser. The commitments can be intense, but also a great way to bond and find a community. That's what NPR's Arun Rath found when he took his son to represent their town at the National Youth Cricket League tournament earlier this month. ARUN RATH, BYLINE: It was a gorgeous sunny day over the Fourth of July weekend, and I was on a baseball field in Connecticut watching my boy compete in the all-American game of cricket. RATH: His team, the Lexington Cricket League, was not doing well. UNIDENTIFIED MAN #1: Get off the wicket. UNIDENTIFIED MAN #1: Get off the wicket. Get to the side. RATH: It was their first time playing at tournament level. Instead of the soft, tennis-like ball they were used to, they were facing the traditional hard leather ball. Nuh Shaheer quickly learned you have to relax to catch it. NUH SHAHEER: It hurts. It doesn't hurt that much, but it hurts, like, when you're scared. RATH: Unlike baseball, outfielders in cricket don't get gloves. Batting is also trickier. You're not just trying to hit the ball, but keep it from knocking down a set of wooden stumps behind you. SOHUM ATNOOR: Well, it felt kind of nerve-wracking. Like, when I was batting it was just, OK, hit the ball and don't let it hit your wickets. RATH: That's 12-year-old Sohum Atnoor. SOHUM: It was even scarier bowling because if they hit, like, a six I would just feel terrible about myself. RATH: Bowling is equivalent to pitching in baseball. Hitting a six is like a home run. They were skills the East Bay Cricket Club had mastered. RATH: Our side - not so much. My son got bowled out, the stumps knocked down on his first pitch. Dads were drying tears on the sideline. Lexington Cricket is just a few years old. It started with a pickup game. Vivek Gupta took his son and a few friends down to the park to show them the game he grew up loving. VIVEK GUPTA: And suddenly we started seeing some kids walking in, trickling in. So some Indian parents, they just dropped their kids and went away. So (laughter) we said, OK, since you're here, let's start playing. And that - those kids started growing. More and more kids started coming. So now we said, OK, if there's enough kids, let's get them organized. RATH: On the second day of the tournament, we were facing the reigning three-time champions, and again, we were getting crushed. But it was a much happier sideline. Our boys got some nice hits in. RATH: Coaches were doing drills on the sidelines during the game, keeping the players encouraged. UNIDENTIFIED MAN #2: Watch it. UNIDENTIFIED MAN #4: Nice shot. UNIDENTIFIED MAN #3: This is your bad, dude. RATH: And even though we didn't win that game or any of the others, the kids had a blast. SOHUM: I feel like we were just having fun because this is - like, it didn't really matter what happened. This is our first tournament. It's supposed to be, like, a team bonding thing. And I got to make some good friends with the people I was around with. RATH: The same was true for the parents. The big attraction for a lot of us isn't so much cricket. I played the game maybe five times as a kid. It's more about connecting with other people of South Asian descent. We call ourselves desis. UNIDENTIFIED MAN #5: (Singing in foreign language). RATH: The gatherings for the tournament had more the feeling of a big desi family reunion than a sporting event. It was nice for us, but we also realized that cricket can't grow in America if it's only desi kids playing. Vivek Gupta. GUPTA: We've not been able to do a good job of sort of communicating to them, yes, that we are doing organized sport for the children. So it's just a matter of time before they come to know and, you know, they get more awareness. 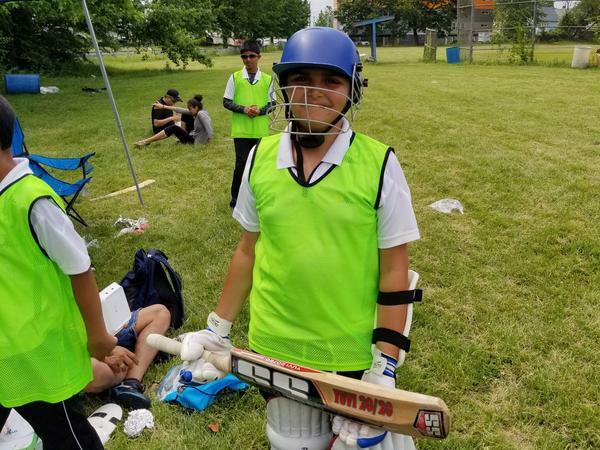 RATH: Gupta and other organizers want to reach out to other communities of immigrants from cricket-loving countries like England and Australia and African and Caribbean countries. But the goal is to get all American kids as excited about cricket as this group. Arun Rath, NPR News. Transcript provided by NPR, Copyright NPR.